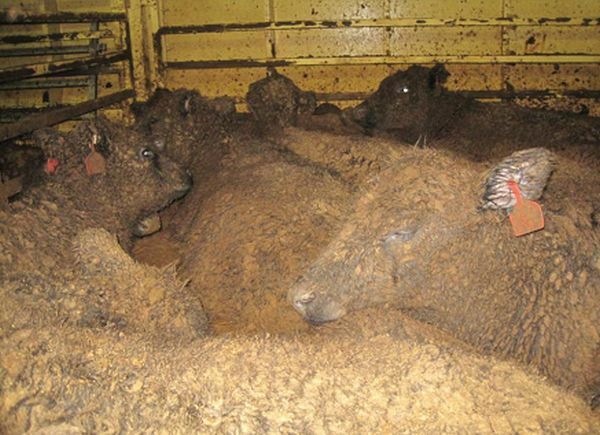 Tweet Abbott & Bishop, Australians are NOT sorry for Live Export Cruelty! Tony Abbott our newly elected Prime Minister and Julie Bishop MP announced in their election campaigning that they would visit Indonesia and apologise to the Indonesian Government, for our suspension (for a few weeks) of the LIve Export Trade when it was discovered that Indonesia was systemically abusing and torturing our Cattle. Tony Abbott has done just that on his visit to Jakarta. He said he was sorry for “Australia cancelling the live cattle trade in panic at a TV program”. Mr Abbott a comprehensive investigation of this ACTUAL footage , PROVED that this cruelty not only existed but was SYSTEMIC. And now we have the Minister for Agriculture, Mr Joyce hinting he will look at loosening ESCAS – the basic framework to Audit and set guidelines for 3rd world animal welfare. ESCAS was enforced on this Industry as it had for 20 years failed to ensure the welfare of it’s animals, and still it seems with ESCAS in place, continues to be responsible for cruelty to Australian Live Stock on a mass scale. Australia had been exporting Cattle to Indonesia for over 20 years, and it took just one Australian woman with a Camera to show the world what this Industry was profiting from – Cruel, heinous handling and slaughter – kicking, roping, stabbing, eye gouging, whipping, beating, tripping over, Australian Live Export officials had only recently visited and had on their own records witnessed similar slaughter but did NOTHING to stop or change it. The MLA’s own report, an Industry report had reported the same cruelty in their visit to Indonesian Abattoirs, yet nothing was done other than outlining some “recommendations”. They even sang the praises of the infamous cruel Mark 1 boxes, which was their version of World Class Animal Welfare – which was shunned and denounced by the worlds leading Animal Welfare/Agricultural experts such as Dr Temple Grandin. 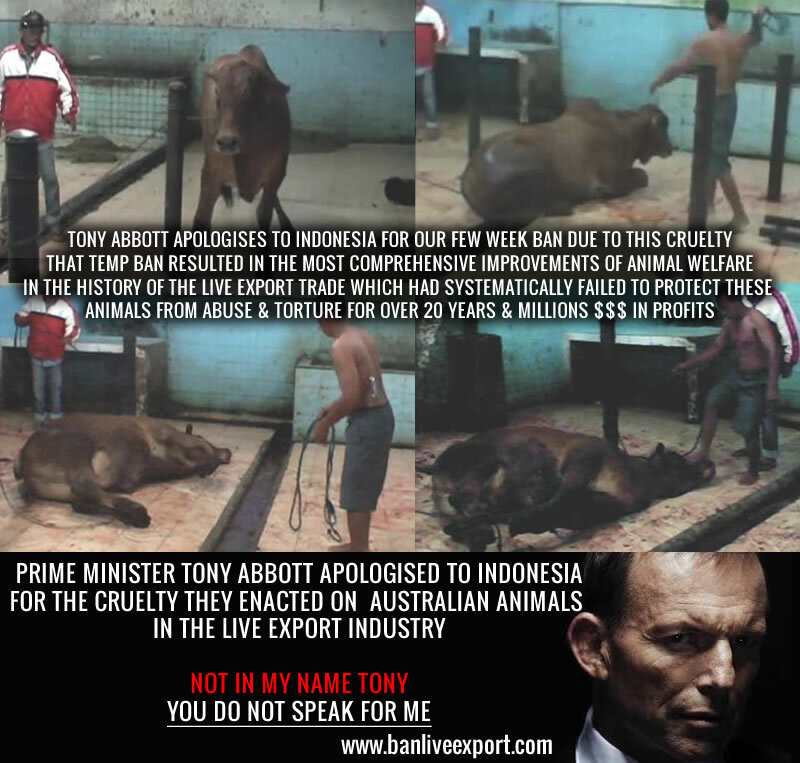 Mr Abbott Australians are NOT sorry that we suspended Trade whilst we ensured that our animals were protected! Australians are NOT sorry that we acted to stop this cruel trade with a cruel history and demanded that the Live Export industry clean up their bloody act. Australians are NOT sorry that the Live Export Industry failed these animals, if this cruelty and torture had occurred on our shores, their actions would be criminal, but their crimes go unpunished as they benefit from their cheap overseas slaughter model of business which allows them to operate in countries with NO animal welfare laws or standards. The Liberal Coalition Government is determined to expand Live Export, regardless that it is a dying and outdated trade as Global Chilled Meats expand (and yes we supply larger quantities of chilled meat to the same countries we send Live animals to, Live Export just use the cheap labor to increase their profits and take jobs away from Aussie meat workers), and regardless of the serious history of animal abuse and the risks of the animals welfare. TELL TONY ABBOTT AND JULIE BISHOP THAT YOU WON’T HAVE THEM APOLOGISE IN YOUR NAME! AUSTRALIA IS NOT SORRY FOR LIVE EXPORTS SUFFERING AND ANIMAL CRUELTY AND AUSTRALIA SAYS NO TO LIVE EXPORTS! 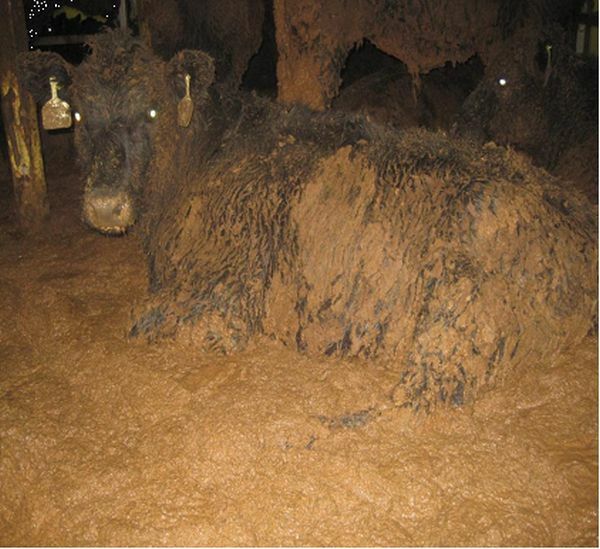 Live Export Profited for 20+ years from this – Who is sorry? You don’t speak for ME Mr Abbott! A series of images – all care of the Australian Live Export Industry, for public distribution. The Live Export Industry thrives on being out of sight out of mind. These images although confronting and distressing, MUST BE SEEN as the truth must be revealed. The Industry got away with mass torture of Cattle in Indonesia for 20 years before a caring Animal Activist exposed the truth of their business. This is a business. This is about cheap overseas abattoirs and $1 a day workers, using low welfare, below western standard (illegal slaughter practices under Australian Laws) all for the highest profit return. Their mark up is huge, because they refuse to process on shore like the rest of Australia’s Farmers who use Australian Facilities, Labor and support their local communities by not taking their jobs offshore. Live Export is a bloody, dirty and cruel business and it is Australias Shame. Please Share these images, contact your Local MP, and visit www.banliveexport.com for ways you can HELP give these animals a voice today. Many media outlets are incorrectly reporting that the Top End “Cattle Crisis” is due or partly due to the temporary Live Export ban in 2011. The Cattle Crisis is an over supply of Cattle, with no market to export to, no local abattoirs to process the Cattle (highlighting the need for our own processing requirements for long term stability and security in food production), and a drought in some areas affecting Farmers ability to provide adequate feed. The Truth is that Indonesia (who accounts for 45% of our Live Exports and is the Top End Live Export Farmers main Market) announced as far back as 2009 their internal Policy to become Self Sufficient in Food Production (including many staple foods such as Rice and Sugar). They have a belief as a Government and a Nation, that they should be producing the food to feed their own citizens, to have food security and to invest in their own employment, manufacturing, farming and food processing. Indonesia has implemented a number of reforms to its agricultural sector in the past decade aimed at achieving food security, ensuring affordable prices for consumers, raising competitiveness for agricultural products and diversifying away from carbohydrate production towards animal-products. The new Food Law, passed in October last year, aimed to institutionalize self-sufficiency in food production as the overarching food security policy. This is in line with the country’s intensifying drive for economic nationalism. Article 14 of the law states that ‘sources of food supply are from domestic production and national food reserves’ and only ‘in the case of shortage of food supply from those two sources, food can be fulfilled by importation, as needed.’ Amongst the objectives of the policy is a goal to reach 90 per cent self-sufficiency in beef production by 2014. This Policy was made public and the Live Export Industry and Australian Government were well aware of their plans to cut all Cattle imports by 2012 (since extended to 2014) inline with their Self Sufficiency plans. Prior to the temporary ban after the discovery of the reality of the cruel handling and slaughter methods that were happening in Indonesia, the Indonesian Government had REDUCED their Cattle Import Quotas by 700,000 head, so Australian Live Cattle Exports were immediately cut by 1/3rd. The further quota reductions have been in line with this plan, and the Government as never wavered from their Self Sufficiency Policy as mentioned above with the Policy now being Indonesian Law. Many in the Live Export Industry question Indonesia’s ability to meet this plan, calling it unachievable. This however is ultimately Indonesia’s concern and has no bearing on the position that the Cattle Industry is in, whether we believe the can or will achieve it now or in the short term, the reality very well is – that we have an entire Top End of Cattle Producers reliant on one Customer who has been telling them for 3+ years, that they will be ceasing their trade, entirely. The only contingency plan we have seen to date, is AaCO announcing the establishment of a Darwin Abattoir to process it’s own Cattle in for Boxed Beef Exports. They are talking about self-sufficiency in terms of 90pc of their domestic production meeting the demand by 2014, leaving just 10pc of future demand to be filled by imports. Australia Network: Indonesia has embarked on a strategic program to ramp up food production and become self-sufficient in basic commodities like rice and sugar. The Australian Meat Industry Employs collectively over 200,000 Australians. From slaughter, to boning and processing, to supply chain services and retail. These jobs support rural communities, add significantly to our economy and ensure that our animals are processed under our Humane and developed Australian Welfare Standards and Laws. Live Export takes away these jobs, many reports (refer to these here) confirm that the impact of sending meat worker jobs overseas – with tens of thousands of jobs lost, and processing facilities closed – many due to low through put and processing well under capacity. The value of processing Australian animals on shore means more than 20% more to our economy, tens of thousands of more jobs and a stable, sustainable industry. Australian Meat Workers process 7 x the volume of meat that Live Export sends overseas – and the chilled industry continues to flourish – and Australian Meat Workers are the backbone of this supply chain and industry. The MYTH that the Australian Meat Industry Employs only 457 Visa Workers (Foreign Labor) is one that is perpetrated by the Live Export Industry. Which is interesting as their whole model of trade is setting up and supporting 100% Foreign Labor in their overseas processing facilities, which we know, are worlds below our standards in Australia. “Whilst it might seem at face value that there is a large percentage of foreign workers employed in meat-works and related industries, it is really predominantly a change of cultures that is being seen,” Mr Dart said. “At last count, our business was employing people from 23 different nationalities, but 99 percent of these are Australian citizens, mostly new to manufacturing-type employment,” he said. While there was now a strong ethnic origin bias evident in many abattoirs, the key point is most of these employees are Australian citizens, not from overseas. “This is a real paradigm and culture change for any industry and its employers,” Mr Dart said. “We would estimate 457 visa holders would currently represent somewhere between 5 and 10 percent of all food processing and manufacturing employees in Australia. Beef Central collected employment data from five large export-licensed processing plants, located from Central Queensland to southern NSW. Collectively, the five plants employed 3010 permanent staff. Of those, just 176 were imported labour, representing 5.84 percent. Individually, the proportions of foreign labour at each site ranged from 12.9 percent to zero. Latest Department of Immigration statistics also illustrate this another way. Of the 4730 457 visas granted in Queensland during 2010-11, just 130 (1.5pc) were made under the skilled meatworker category. Nationwide, the total number of 457 visa holders under the entire agriculture, forestry and fishing category is only 2.5pc. NO. LIVE EXPORT DOES NOT FEED THE WORLDS POOR BY ANY STRETCH OF THE IMAGINATION. Live Export export exports to the middle class to wealthy destinations and markets. In fact Egyptian Abattoir workers went on the record confessing they often steal tongues to take home to their families to feed them – as they cannot afford the meat they process under their slave/sweat shop wages that Live Export profits from. Live Export cuts out Indonesian Pheasant Farmers, who collectively at 700,0000 – have lobbied their Government to cease live Cattle imports as they are kept poor, unable to compete with Australian Cattle Imports. Support for a ban of live cattle exports to Indonesia is now coming from Indonesian Farmers. The 700 thousand peasant farmers in Indonesia want the ban so demand will increase for their cattle. “We would like to explain to the public in Australia, each country for building food sovereignty for the long term, the problem of the food will become the basic problem for people in the world.” Read more about the effect Live Export has had on Indonesian Farmers here. QATAR is one of the region’s wealthiest states due to its enormous oil and natural gas revenues. KUWAIT has the world’s fifth largest oil reserves and petroleum products now account for nearly 95% of export revenues and 80% of government income. Kuwait is the eleventh richest country in the world per capita. UAE oil reserves are ranked as the world’s seventh-largest. It also possesses the world’s seventeenth largest natural gas reserves. The UAE has one of the most developed economies in Western Asia. Per capita income is the world’s seventh highest. MALAYSIA has one of the best economic records in Asia, with GDP growing an average 6.5% for almost 50 years. ISREAL . Israel has one of the highest life expectancies in the world. It is a developed country, an OECD memberand its economy, based on the nominal gross domestic product, was the 43rd-largest in the world in 2012. Israel has the highest standard of living in the Middle East and the third highest in Asia. The Australian Meat Processing Industry Employs collectively over 200,000 Australians from slaughter, to boning rooms, to distribution to supply chain services. The industry is worth billions to our economy, supports Australian Workers, supports rural communities and slaughters and processes animals under Australian Welfare Standards and Laws. Live Export EXPORTS Australian Meat Worker jobs. The Australian Meat Workers Union estimates that 70 abattoir closures and the loss of up to 12,000 jobs are directly attributable to the live export trade. To read about the 457 Visa Worker MYTH the Live Export Industry perpetrates CLICK HERE. It is interesting they bring up foreign workers on Australian Shores (which is untrue as you will read via that link) – when they support 100% foreign Meat Workers in their trade? The whole model of Live Export is based on a quick sell/transaction, and the Exporters then make a very healthy profit using foreign labor at sweat shop rates well below the Poverty Line, some for $1 a day. Live Export outsources Australian Meat Worker jobs. Live Export Slaughters animals under cruel O.I.E guidelines, sending animals on grueling journeys to face a fully conscious death in most cases – under conditions and methods that would be illegal on Australian shores. Meat Processing On Shore in Australia is not only financially viable but it is profitable, and would create thousands of more jobs for Australians. We can and should process the animals here, supporting jobs and adding 20% more to our economy. Australia’s Chilled Meat Industry Exports 7 x the Volume of Meat that Live Exports does. Australia has the capacity, Australia has the facilities and tens of thousands of workers who are at this very moment processing meat onshore for Australians and to export to the world on a large scale. But Live Exporters say Sheep can’t be processed here? Well Australia’s major sheep processors have confirmed that they have the capacity to process all sheep currently going to live export. 32 million sheep are slaughtered in Australia each year, and only just over 2 million sheep are exported live. And there are around 8 million cattle slaughtered in Australia each year. In 2010, around 500,000 cattle were exported to Indonesia; with just over 400,000 exported to the same country in 2011. Thus, cattle exported make up only a very small portion of the total cattle industry. 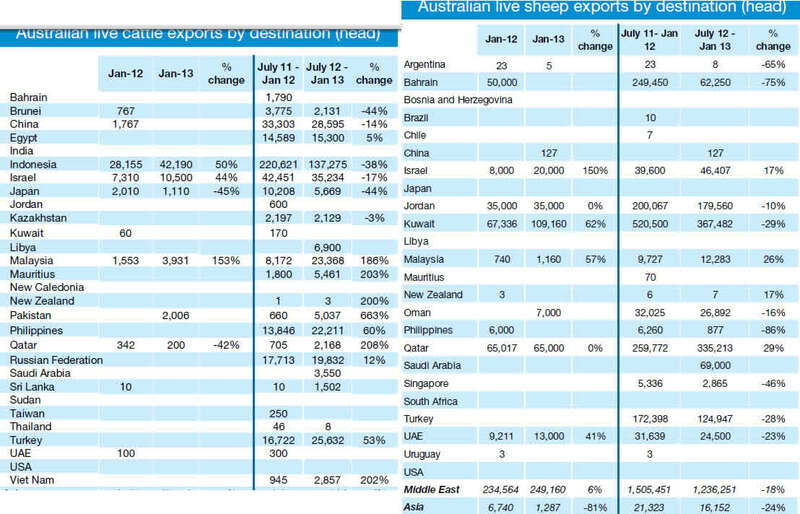 Live export represents just 0.3% of Australia’s total exports. There exists sufficient spare physical processing capacity in Western Australia to absorb the entire Australian live sheep export trade as it currently stands. This translates to a higher contribution to WA’s Gross State Product. Industry turnover could rise from $700 million per annum to $2 billion per annum (ACIL Tasman, 2009, Page 51). “Live cattle exports are cannibalising Queensland’s beef industry, striking at the heart of its value chain. If left unchecked live cattle exports will bring the State’s beef industry down with disastrous effects for asset values, investment, household incomes and employment.” The report suggests live export has grown almost unnoticed over the last 15 years, encouraged by “subsidisation and protectionist trade policies.“It is in no sense a ‘competitive’ Australian industry operating on a level playing field,” Heilbron says. Live exports are increasingly taking our premium disease free cattle out of Queensland’s beef industry value chain – cannibalizing the industry and allowing operators overseas to produce premium “Australian beef” in competition with genuine Queensland product. The inevitable end result of an uncontrolled live export activity is a shrinking, and the ultimate demise of a major Queensland high value added industry with huge loss of assets income and employment. Domestic processing of livestock contributes more to regional economic activity and employment than live animal exports. The Taskforce believes the growth in live exports, at the expense of meat processing firms, is at least partly due to a lack of competitive neutrality that can be attributed to the policies of foreign governments. A veterinarian who spent more than a decade working on live export ships has accused her former employers of putting profits ahead of animal health in the latest damaging blow for the industry. Lynn Simpson listed a host of examples of sheep and cattle being smothered and injured in overstocked and dirty pens on long-haul voyages from Australia. Her submission to a review into Australian standards for the export of livestock also includes disturbing onboard pictures of injuries, overcrowding and cattle heavily coated in faecal matter. Dr Simpson was employed by exporters as the onboard vet on 57 voyages from 2001 after graduating from Murdoch University. She estimates 70 per cent of the voyages left from WA ports. Dr Simpson worked for all major exporters but has not named any of her former employers in her 44-page submission, which makes a range of recommendations on improving animal welfare. “It should be appreciated that these voyages are not all short and clean as depicted by industry and their public relations machine,” she said. “Export can be done in a sanitary manner, however at this point in time it is being done primarily to commercial advantage and not in general prioritising the wellbeing and health of the animals loaded onto vessels.